The Design to Robotic Production STUDIO/WORKSHOPs explore and develop novel possibilities of implementation and integration of Robotics in Architectural Design and Building Industry. Therefore a series of purposeful, Performative and informed Design to Production Processes will be designed and tested to eventually realize a one-to-one building prototype. This prototype will be a part of the design project in the studio, which is a student housing cluster. In workshops we are aiming at providing the required/unique practical knowledge to inform the design process. Simultaneously applicable and relevant Computational Design Techniques will be implemented to materially inform the design exploration processes. _The robotic industry is growing fast, and building industry is one of the main realms for this growth. _Robots are programmable/flexible machines and by integrating computational/parametric design processes with robotic productions systems we can bridge the gap between digital design interfaces and physical worlds of materials and fabrication. _By developing new methods of fabrication and robotization of former craftsmanship, architects can play more active roles in the future of construction industry. Objectives: Performativity / Scalability / Customisation (PSC) The objectives behind exploring HVC subjects are Performativity, Scalability and Customisation. For instance by performativity we mean that certain scenarios and process for addressing and realizing multi-materiality, density differentiation and componential logic should improve the overall performance and efficiency of the design/building solutions. At the same time we have to identify to which extent each of these scenarios are and can be scalable. And by defining customisation as one of the main objectives, from the very early stages of design we’re going to inform the design processes by involving the robotic production processes and by understating what is possible to not only make an initial impossible “possible” but also make customisation of building components possible. Parameters: Structural / Environmental (SE) In this studio and workshops of Architectural Studies, we focus on structural and Environmental parameters. Therefore in the form finding processes certain parametric/generative tools and methods will be explored and applied for structural and environmental evaluations and optimization. Basic available materials in this workshop/studio will be Various types of EPS Foams, Various types of Ceramics and glazing, Various Types of Concrete and woods. Steel fibre or profile and other materials will be used if it was required based on the designs. For the form finding workshop each group print test models with PLA. Before Starting of the Robotic D2P workshops you will receive detailed information on where (and how much) to get the materials. To have an initial investigation we would recommend you to visit GAMMA (www.gamma.nl) and BOUWCENTER www.bouwcenterkoolschijn.nl at Delft, and gather numerical (Prices/Properties) and visual (Raw/Finished) information. Techniques and Materials. Since the goal is not to bound ourselves to one single technique in this studio we are going to purposefully apply and combine various robotic production techniques which are Additive Manufacturing(AM) / Computer Numerically Controlled (CNC) milling / Volumetric Cuttings (VC). 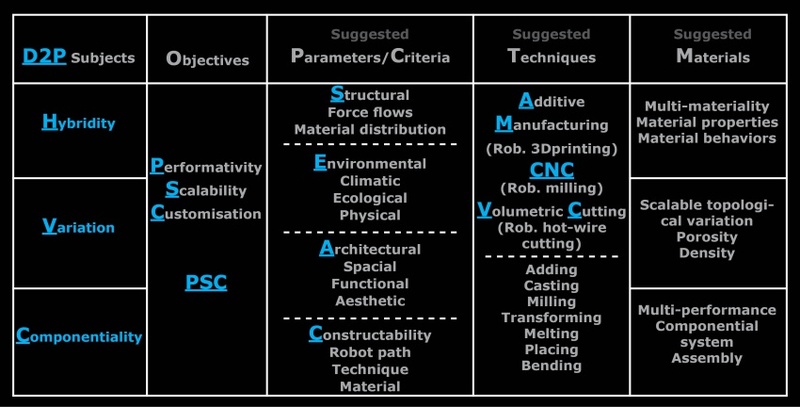 To be more specific the AM will be Ceramic 3D printing, CNC will be Robotic Milling and VC will be Robotic wire cutting. What is important here is that we are going to use these techniques considering the fact that Robots are flexible, Customizable and Programmable machines. Therefore, in each of the 3 initial (HVC) prototypes, and eventually the final design, this level of flexibility should be obviously distinguishable. in other words, we do not want to do something that is possible to do it with conventional AM,CNC,VC methods like Contour Crafting, CNC (3Axis) Milling, linear (2Axis) cutting, etc. Therefore rather than thinking about these techniques as isolated processes you may think of material processing and fabrication scenarios like depositing, removing, placing, casting, forming, transforming, etc. >>>Through these three initial experimental design to production prototypes we will develop required insight, knowledge and technology for design and realization of the final prototype (A part of Student Housing Project). The maximum size of the initial prototype would be a quarter of a cubic meter in volume for its bounding box!. For instance 25x100x100cm. The Spring semester Robotic D2P studio, Start at the end of Feb until end of July 2015. 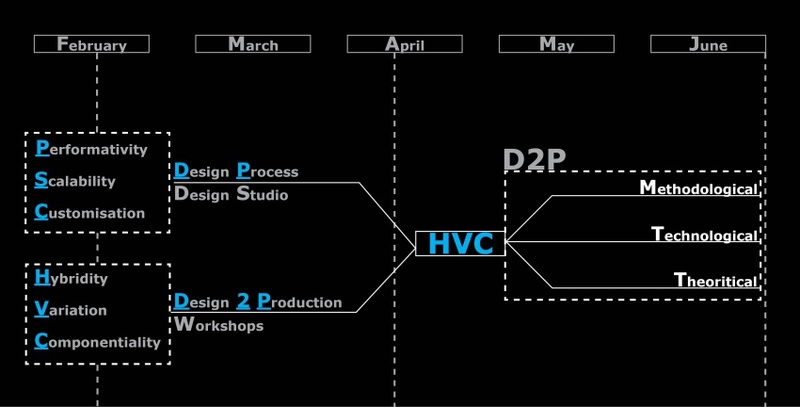 There would be two parallel working stream in the beginning for both workshops and studio, which are, designing of the student housing project and D2P experiments / Prototyping processes. In the mid of the semester we will merge these two streams and converge our efforts to develop and realize the final design and one-to-one prototype. All three groups should be present during the workshop and studio hours in protospace. Mid March we move to a new space due to the construction plan of the faculty. Until mid March we would work with our ABB Robot in the Hyperbody Robotic Lab next to the protospace. Simultaneously we will start with setting the new KUKA Robot in another space in the faculty and move the ABB next to it. Please be aware of this fact that when you're working in Lab you have to consider all safety regulations!. And if you are unsure about any procedure don't hesitate to ask from Lab members. The results of the workshops and the studio, including prototypes, experiments, videos and posters will be exhibited in the well-known V2 gallery (v2.nl) in Rotterdam. Therefore we have to push the boundaries and end up with elegant informed designs and prototypes!. Matteo Baldassari as assistant tutor, Pablo Baquero, Yunsong Han, Xlaoan Li who will help us as Visiting PhDs in workshops andMarco Galli MSc4 Student as student assistant. This page was last modified on 16 June 2015, at 16:07.